Clarence Place was a small terrace of four dwellings off the west side of the southern end of Clarence Street. It was sandwiched between Joseph Brutton's malthouse to its north and the Yeovil Iron & Brass Foundry, owned by Sansbury & Savery then William Rowe and finally acquired by James Petter in 1872. Clarence Place was referred to in an indenture dated 1709 "Gardens adjoining Nos 1-4 Clarence Place".. The Poll Book of 1832 shows that the houses were owned by John Thomas of Middle Street. The terrace is listed in the 1841 census and would have appeared to be somewhat more salubrious than the majority of similar courts tucked away off various streets in Yeovil. The residents included a draper and two other dwellings were occupied by elderly ladies of independent means; all three had servants living in. In 1845 John Aldridge moved to Yeovil and established a school in one of the dwellings in Clarence Place. By the time of the 1851 census John had moved his school to a large house in Kingston, next to the Red Lion Inn. This was to become known as Kingston School. In 1849 Clarence Place was advertised for sale in the 19 June edition of the Yeovil Times "To be sold by Auction by Mr A Cox at the School Room formerly occupied by Mr Aldridge. Neat modern household furniture, paintings, books, school desks, forms etc." The school was subsequently used by the Plymouth Brethren as their Meeting House. In the 1851 census one of the dwellings was occupied by a 98-year-old widow, listed as a proprietor of houses, with her servant. Next door were two widows, one a house proprietor the other an English teacher. The other two properties were the residences of glovers and their families. The situation was very similar in 1861 with two houses occupied by ladies of independent means with their servants, the third occupied by a silversmith and his family and the fourth by a glover and his family. Only three families were residence in 1871, those of a commercial traveller, a brewer and a retired shoemaker. In 1881 the census recorded Edwin Maidment as a resident; he was headmaster of the National Boys' School in Huish between 1860 and 1905. Also resident were the families of a brewer & foreman, a master painter employing five men and two boys, and a clerk. Clarence Place was mostly demolished in the early 1960s, with one property (shown below) remaining until 1991. 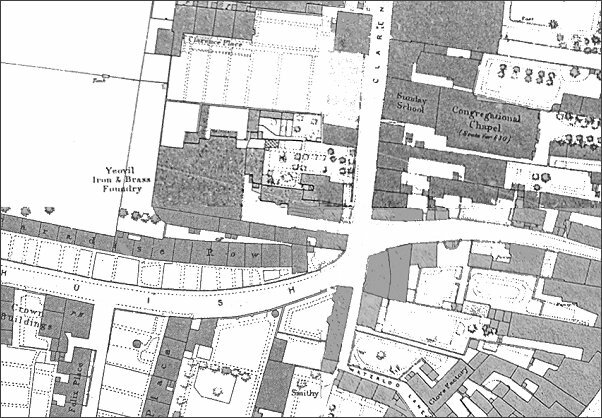 This map, based on the 1886 Ordnance Survey, shows Clarence Place, off Clarence Street, at top with its gardens backing onto the Yeovil Iron & Brass Foundry. 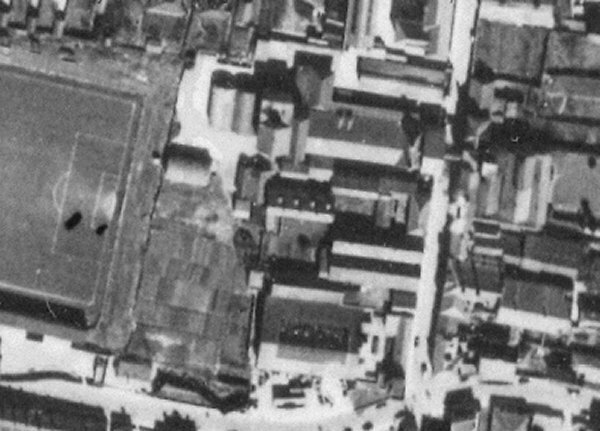 This 1946 aerial photograph shows Yeovil Town football club at left with Huish and Westminster Street running along the bottom and Clarence Street running top to bottom at the right. The four cottages of Clarence Place are at dead centre, clearly marked by the four white dots of their chimneys against the dark roofs. 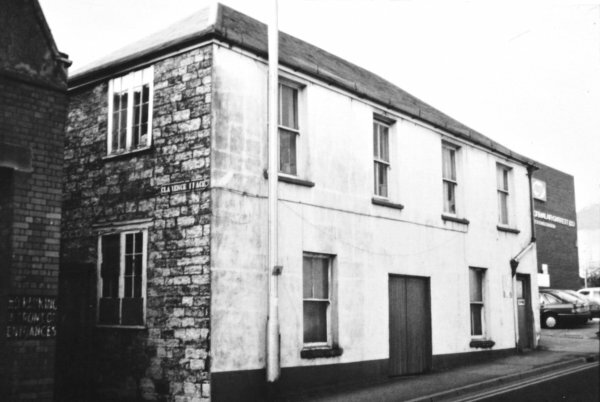 Photographed in the mid-1960s, this building facing onto Clarence Street is often cited as being the Clarence Place building in which John Aldridge founded his school, the precursor to the Kingston or County School, in 1845. In fact this photograph shows only the narrow entrance to Clarence Place (nameplate is on the side of the building) which ran alongside the building in this photograph. The original school was in a building behind these buildings. 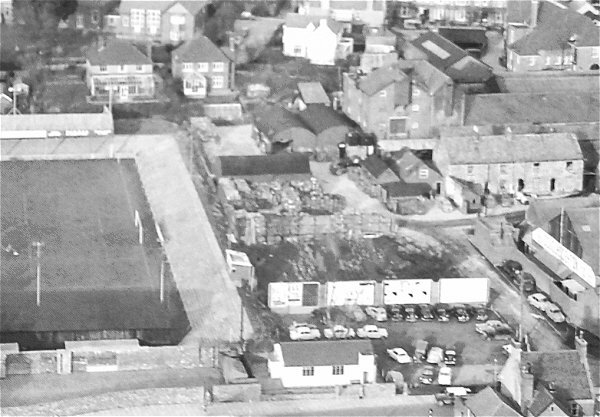 An aerial photograph of 1960 showing the eastern end of the Yeovil Town football ground at left and the cottages of Clarence Place at centre right. 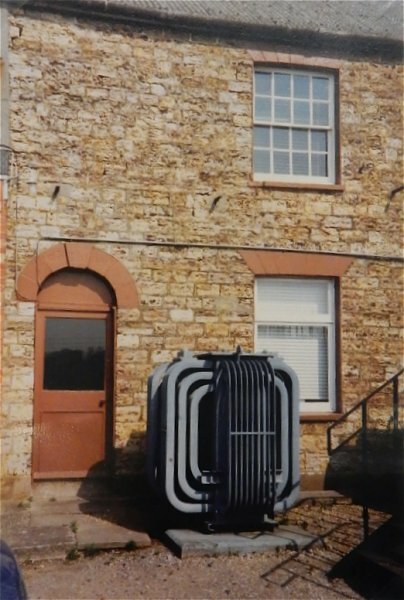 The last house in Clarence Place, photographed in 1991 shortly before being demolished.